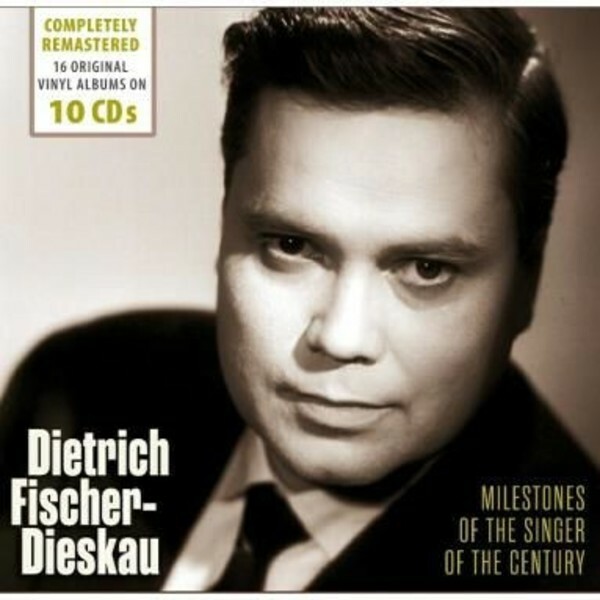 This 10 CD box set offers a comprehensive portrait of the greatest German singer of all time, Dietrich Fischer-Dieskau. It includes sixteen original LPs remastered and presented in one box. Included are rarities and favourites of the romantic era, plus the singer as a narrator. This collection provides a fascinating into Fischer-Dieskau�s versatility. Included are rarities such as the Brahms cycle �Die sch�ne Magelone�, Lieder by contemporary composers where he is accompanied by Aribert Reimann, and the first recording of Schubert�s �Die sch�ne M�llerin� to include the prologue and epilogue, as well as the well-known �Eichendorff Lieder� by Hugo Wolf, Schumann�s �Dichterliebe� and his settings of Heine ballads, Lieder by Richard Strauss and the late studio recordings of �Winterreise�. Finally, the first large-scale production of Verdi arias and the rare �Duette aus sechs L�ndern� (duets from six countries), with Victoria de los Angeles. 8. Ehi ! Paggio! / L�Onore! Ladri! 16. Schl�fst oder wachst du? 24. Dass Sie hier gewesen!